With due dates enabled on your Space, you can set a due date for any task, subtask, or List. Due dates are set at the Space level. This means you can have due dates enabled on some of your Spaces and disabled on others. Select the List you'd like to set a due date for. Make sure you're viewing it in either List or Board view. Click List Details in the upper right corner of your screen. Select Set date to set a due date for your entire List! When setting a start date or due date, you can either select a specific date on the calendar, or type in your desired date just as you would speak. Type in "tomorrow at 2 pm", or "next week", and a due date will be set for that time automatically! Just as in setting a due date, you can also edit a due date anywhere it appears. Just click on the due date and you'll get a drop-down to select a new due date. To delete a due date, hover your mouse over a due date and an X icon will appear. Click on the icon and you will delete the due date. Once you've enabled due dates within a Space, you can utilize them to sort and filter your tasks in List View. Just click on the filter button or select the Due Date sorting option from the columns shown above your list of tasks! Drag and drop tasks on the calendar to add or adjust due dates. Start Dates: Provide accurate time estimates for tasks, and let your teammates know when a task should be acted upon. Time & Date Reformatting: Personalize your ClickUp account to show your preferred time and date settings. Remap Due Dates in Templates: Preserve the relative position of due dates in your tasks without having to manually update them. 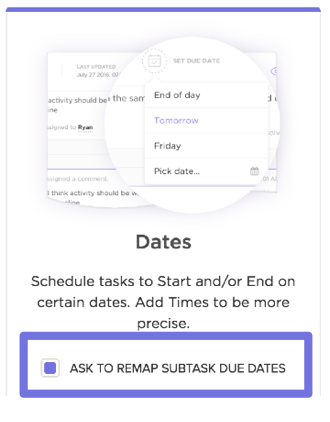 Remap Subtask Due Dates in Templates: If you're creating a template from a task that contains subtasks, you have the option to remap due dates for these subtasks along with those of the parent task. Drag and Drop Due Dates: In Time View, you may schedule and set dates by moving tasks around the calendar. Be sure to let us know what else you would like to see on our feedback board here.